Merz Barn Consultancy: Littoral’s application to Arts Council England for funding to organise a major consultancy on the future of the Merz Barn and the Cylinders site was approved at the end of 2013. The scheduled programme formed the major part of the trust’s work during 2014 and 2015. After some delays the final Consultancy Report is due for completion at the end of 2015. The first consultant was appointed on September 29th 2014, and an Interim Report prepared in December. The work was then taken on by an interdisciplinary team of experts including: architects: Andrew Shepherd, Anthony Hoete (What? Architecture), Sarah Beth Riley (Partial Office), and the Sheffield University School of Architecture; Derek Pullen of Sculpcons (conservation); digital developers Dave Kirkwood (D.K. Studios) and Martin Campbell (MacAmaze); Edward Mills (woodland management), and the Manchester Metropolitan University Department of Landscape Management under Ian Fisher. A final independent summary of the various elements of the Report is provided by John Holden, arts policy consultant (ex Demos). The first public event associated with the consultancy process was the Seminar on the future of the Merz Barn at Cylinders on June 11th 2014. This followed a Gala Luncheon in the marquee, graced by the presence of The German Consul for the North, Gräfin von Roedern, Louise Waterhouse, Leader of the Lakes Parish Council, Alison Clark Jenkins and Jane Beardsworth from Arts Council North, and Penny Vowles ex-Northern Rock Foundation. The Rev. George Wrigley, vicar of All Saints church, Chapel Stile, with Jane Beardsworth, Arts Council North, and Adam Sutherland, Grizedale Arts. 11.6.14. We also ran a workshop programme on site, and pupils from Langdale Primary School enjoyed making Snake Sticks with Joan Sampson. The purpose of the day was to allow attendees at the Merz North meeting of academics in Ambleside that morning to visit Cylinders and see the Merz Barn for themselves, and the kind of programmes that were taking place. There was also an open invitation to people living locally to come and take a look at what was happening. Then, after the welcoming speeches by the German Consul, our vicar George Wrigley, Mike Glover, and others, the Seminar took place, giving an opportunity to all those present to voice their opinions. Attendance was excellent (greatly helped by the friendly articles in the Westmorland Gazette), and the sun shone. All in all, a most successful day. Housing Merz in the 21st Century Conference, Tate Britain, November 27th, 2014. 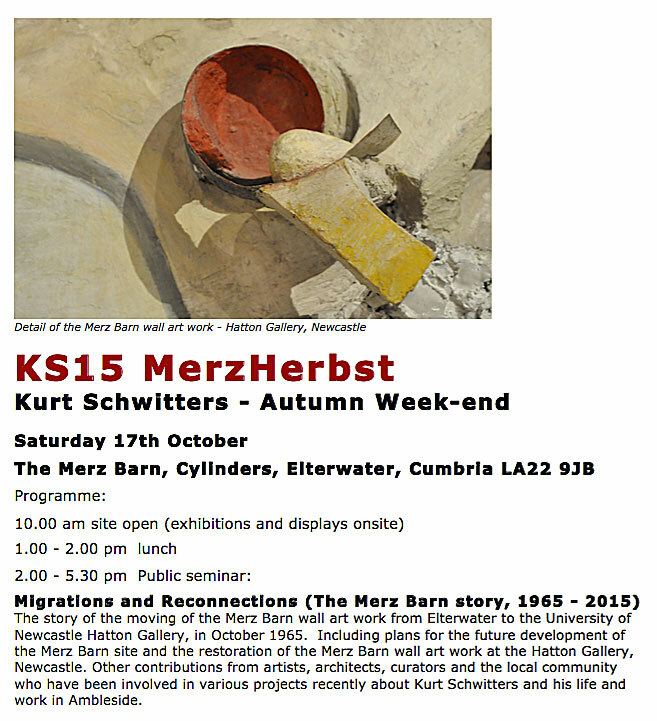 The artistic legacy of the Merz Barn and Kurt Schwitters in Cumbria; new critical intersections for contemporary art and architecture. With: Dr Isabel Schulz, Curator Kurt Schwitters Archiv, Sprengel Museum Hanover; Dr Karin Hellandsjø, Director Kurt Schwitters and Norway project. Oslo; Dr Adrian Notz, Director Cabaret Voltaire, Zurich. Introduced by Dr Penelope Curtis, Director Tate Britain. Martin O’Connor with the paintings he created for presentation to PEN England. This Symposium, organised by Littoral with the support of Tate, was designed to support the Merz Barn consultancy process by a) enabling key stakeholders to speak directly to one another, b) carry the regional conversation to national level, and c) showcase examples of successful and similar projects in Britain and elsewhere. The Symposium was introduced by Dr Penelope Curtis, Director Tate Britain, and Pauline Tambling, Chief Executive, National Creative and Cultural Skills Council. The Minister for the Arts Ed Vaizey M.P. delivered an encouraging message during the lunch break, supporting the plans for development of the Merz Barn project in Cumbria, and this was seconded by Helen Goodman M.P. Shadow Minister for the Arts. The Rt. Hon. Ed Vaizey M.P. addressing attendees at the ‘Housing Merz’ Conference. Speakers included: Dr Isabel Schulz, Curator Kurt Schwitters Archiv, Sprengel Museum Hanover; Dr Karin Hellandsjø, Director Kurt Schwitters and Norway project, Oslo; Dr Adrian Notz, Director Cabaret Voltaire, Zurich; Alice Workman, Senior Director, Hauser & Wirth project Somerset; Ida Soulard, Fieldwork Marfa, Texas. ; Deborah Ely, Director Arthur Boyd/Bundanon Trust, Australia; Antony Penrose, Farley Farm House and the Lee Miller Archive, East Sussex; Amira Gad, Fogo Islands Dialogues, Newfoundland, Canada, and Mark Leslie, Martello Productions. Peer review: the outdooor installation. The 2014 Summer School was planned as an experiment in self help organisation. The attendees organised it themselves, with the help of two people who had attended the one from the year before. They booked the TOC H Bunkbarn at Chapel Stile for their accommodation, with some additional camping on site at Cylinders. The Travelling Hearth (Christine Dixon and Miki Zed) provided their wonderful catering services. The weather was superb, very unusual for July at Cylinders. Midnight drawing at Cylinders. KSDIY Summer School, July 2014. Annual 2014 Kurt Schwitters lecture – Alec Finlay, Scottish artist/poet: Schwirrlauf | tschaa! : the evolution of primal motion a phylogenetic; recomposition of the avant-garde. A post-Darwinian reflection on Schwitters poetry, art and philosophy. ‘Shippon’, the notebook on which Julie worked during her residency at Cylinders. Resisting Absence, Residence at the Merz Barn by Manchester artists Jackie Haynes, Phoebe Myers, Bethany Cassidy, and Jayne Seddon, January 9 – 11 2015. Residency by Jill Randall + 9 second year art students from the University of Salford, 24th to 26th March 2015. At the beginning of 2014 the Arts Council awarded the Littoral Trust Grants for the Arts funding to allow us to undertake a comprehensive consultancy study in order to produce a report on the future development/restoration of the Merz Barn project, and the associated site at Cylinders, Elterwater. The final report has been submitted to the Arts Council and main national and regional stakeholder partners, and the 12 first pages are available to download via a link from this website. ‘No One Left and No One Came and Nothing Happened’, Exhibition of works by Martin O’Connor, The Shippon Gallery, April 30 to May 22, 2015. Martin O’Connor: putting up the Exhbition. Jane Exley: Exhibition in the Shippon Gallery. Photo Rob Fraser. Sarah Tew: ‘Sky Bowl’, Installation at Cylinders. Water, dyestuffs, plastic. Panoramic view of the Exhibition. Photo Martin Campbell. ‘Resisting Absence’ : Residence at the Merz Barn by Manchester artists Jackie Haynes, Phoebe Myers, Bethany Cassidy, and Jayne Seddon, January 9 – 11 2015. RETREAT, February 20th, led by Michael Whitby, with Warren Andrews, Hamish Macpherson, Sam Venables, Llewellyn Watkins, Paul, Ellie, Charlotte, and Nicole. 24th to 26th March Jill Randall + 9 Salford University second year students. Group of 17 Manchester Metropolitan University landscape students at Cylinders on April 30th and May 12th to prepare a report on the Cylinders gardens for the Consultancy Report, under the direction of Ian Fisher. Radical Routes Housing Co–op, Bradford, with Lukas Hornby, Ana, and a party of 7: experimental workshop with the printing press. The printing press is the original one owned by artist Gwyneth Alban-Davis, who operated it from The Caravan Studio in the holiday camp complex opposite Cylinders, now the site of the Langdale Timeshare. The press was generously donated to the Merz Barn project by Gwyneth’s son Bill Davis in 2013, and equally generously renovated and put in working order by Giles Hovenden in 2014. Woodcut by Gwyneth Alban Davis showing the shippon as a cowshed. This was printed on her press, now on long loan to the Merz Barn project. June 19th to 21st: Jackie Haynes organised a coach trip to the Merz Barn, for 25 Manchester and Salford-based artists, including some from Islington Mill and Castlefield Gallery Associates. 19.06.15: Launch of the Friends of the Merz Barn by Mike Glover. We are happy to announce that the list of Friends is now running just shy of 500 people. Dada procession for Kurt Schwitters’ birthday. Manchester artists take the Merz Path. 20.06.15: Celebration of the anniversary of Schwitters’ birthday, with a bizarre Dada procession and various other happenings. See <https://www.youtube.com/watch?v=L2vZz2zAG8E&feature=share&gt; for video of the ‘gribbitt gribbitt’ game in the Merz Barn. In the evening Littoral hosted a barbecue, attended by our old friends the Lakeland Fiddlers, who on the following day performed their annual tribute to the Langdale fiddler William Irwin, at his graveside in the Chapel Stile churchyard of Holy Trinity church. The Lakeland Fiddlers, led by Carolyn Francis, playing at the graveside of William Irwin, Langdale Fiddlet. Following this event, and in preparation for the centenary celebrations of the founding of the Dada movement, on June 29th we organised a Dada Symposium at Islington Mill, guest speaker Adrian Notz of the Cabaret Voltaire, Zurich. Adrian Notz speaking about the Cabaret Voltaire at the 2015 Dada Symposium in Manchester. Photo Roger Bygott. And in September artist Jackie Haynes organised a second Dada Seminar in Manchester. Alt MFA Group: Louise Ashcroft, Alex Chalmers; Gillian Duffy; Sadie Edgington; Amy Leung; Megan Jenkins; Fritha Jenkins, Shinji Toya, July 27th to August 1st. MILESKM/Tanteo group: 5 day placement for 10 artists, July 26th to 31st. ‘An integral part of the Tanteo, will be the collaborative research project that will aim to explore and challenge the current forms of art education whilst offering alternatives. The research will inform the form the project takes, it will influence the task of creating and running of MilesKm’s peripatetic art school’. Central St Martins residency: Mel Cole, Sarah Tew, Gill Ord, Anne Robinson, August 1st to 8th. Doremisolasido Residency and Events, 26th to 31st October. Doreimefasolasido is a group residency at the Merz Barn, Lake District National Park (www.merzbarn.net), hosted by Littoral Arts Trust. For one week artists explored the legacy and potential futures of this site, where Kurt Schwitters created his last Merzbau. During the last weekend the artists’ work was on display, with presentations, performances, talks, film screenings and live music all day on the 31st October. Doremi Art Walk above Chapel Stile: Jocelyn MacGregor. Photo Claire Poulter. Video by Rumanian Radu Tutulanu showing some of the party at the end of the Doremisolasodo residency. Workshop leaders: Rachel Brewster (Little Vintage Photography), photographic processing and pinhole photography; Sarah Beth Riley (Partial Architecture), architectural installation; Tom Branton, woodland crafts and coppicing, scything and haymaking, tool maintenance. Exhibition in the Shippon Gallery of photographic artworks by Rachel Brewster, Little Vintage Photography. Dada Symposium, Islington Mill, June 29th,. with Adrian Notz of the Cabaret Voltaire. A follow-up Dada seminar was organised by Jackie Haynes in Manchester on September 23rd. Seminar: The Merz Barn & Me, October 17th with Rob Airey (Hatton Gallery, Newcastle), Mike Glover (Lakes & Bays Communications), Jackie Haynes (Artist), Dr. Mark Wilson (University of Cumbria). Keynote speaker Tom Green, Platforma Arts. The Reading of the Names of the artists included in the ‘Degenerate Art’ Exhibition in Munich in 1937. This event takes place annually in the Merz Plaza, when the names of the artists are chalked on the replacement wall of the Merz Barn by candlelight to the accompaniment of a short blessing. Returning Schwitters’ artwork to the Merz Barn. Kevin O’Connor testing the Googlebox version, with Tom Green. In the background Ian Hunter and Martin O’Connor. Andrew Brammall, one of the team that removed the end wall from the Merz Barn in 1965, with his granddaughter Wren, at Cylinders. Video by Martin Campbell of trial run of his GoogleMerzBox gismo: virtual reality meshes with absent reality! Sound and Audio workshops took place at Cylinders with Langdale Primary School (16 & 17th March) led by Artspace Barrow (John Hall) working a with children from Langdale School, and artist Amy. Further workshops took place at Cylinders with children from South Walney Infants School, South Walney Primary School, and North Walney Primary School on April 16th and 23rd, and May 20th. Martin Bagness and John Hall at Cylinders with children from North Walney Primary School, May 20th 2015. Schwitters’ Snakestick in situ above the door to the Merz Barn, c. 1970. While working on the Merz Barn in 1947, artist Kurt Schwitters created some smaller art works, including painted pebble sculptures and other found objects, which he placed in various locations in and outside the Merz Barn. One of these was a piece of twig from the woods near the Merz Barn, which he painted in bands of bright coloured paint to resemble a snake. He nailed the painted Snake Stick art work above the Merz Barn door, alongside a lucky horseshoe. As the years passed many of the artist’s surviving art works made for the Barn were removed, and even the large end wall work was taken in 1965 to Newcastle. 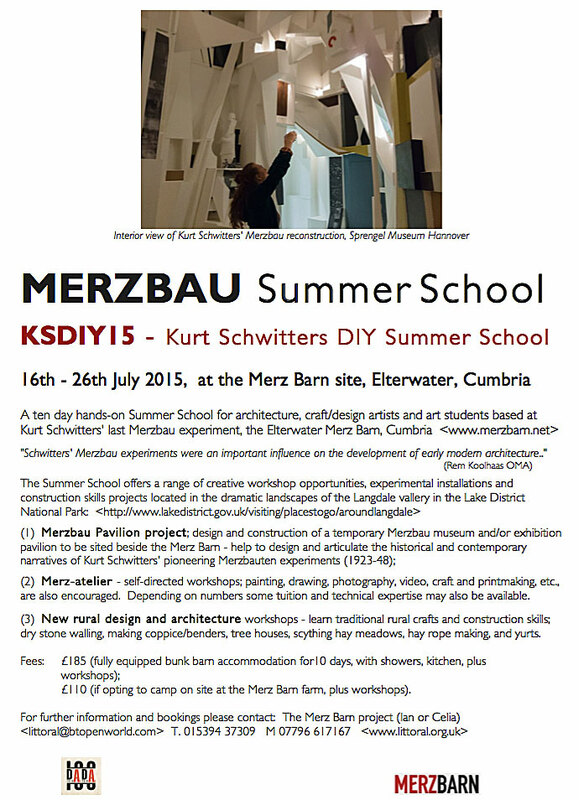 The Merz Snake Stick was the only example of Schwitters’ art works in the barn to survive. At some point however the Snake Stick was removed. Having acquired the Merz barn in 2006 the LITTORAL Arts Trust has been working ever since to restore the building and the site. As part of this process schools, children and visitors to the Merz barn are invited to make their own versions of the Merz Snake Stick, as a replacement for the missing original. These snake sticks are exhibited from time to time on the temporary exhibition boards which line the pathway to the Merz Barn, or in the Barn itself. Local schoolchildren from Langdale, Ambleside and Grasmere schools have made Merz Snake Stick artworks, and continue to be involved with the project. Invitation to visitors, schools and colleges – One Million Merz Snake Sticks! : Our long-term aim is to build a collection of a million Merz Snake Stick artworks. Please help yourself to any of the unpainted snake sticks in the Merz Barn. While you are here you are welcome to make you own Merz Snake Stick artwork and leave it on the display board nearby. Or you can take some sticks away, decorate them at home and then post them to us, or bring them with you the next time you come back to Elterwater and the Lake District. We would also like to hear from any other schools, youth groups, colleges, etc which might like to become involved in the Million Merz Snake Sticks art project. Photo Bonham’s Auction House, London. Chidren from Selside School, Kendal enjoying their Stone Age Camp in the Cylinders top field. Stone Age Camp: on September 23rd to 25th children from Selside Endowed CE School took part in an Extreme Camping stay at Cylinders. It rained relentlessly, and blew a gale, but somehow they all survived. 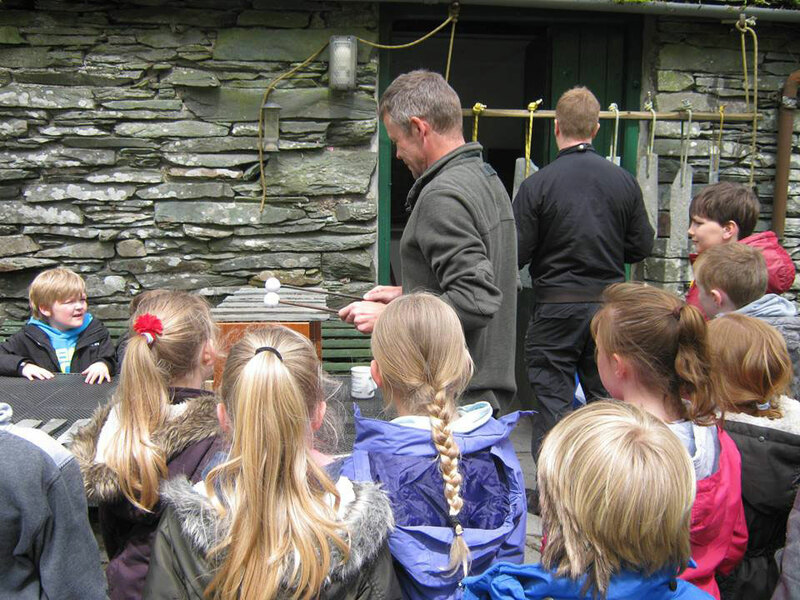 We have a special relationship with the school because their head teacher is Mark Squires, who moved to Selside from Langdale School, and has always encouraged activities with children at Cylinders. Moving the Merz Barn Wall: A celebration with Langdale School of the 50th anniversary of the removal of the Merz Barn artwork from the Barn, October 13th 2015. Children from Langdale School moving the image of Schwitters’ Merz Barn artwork, in commemoration of the removal of the work in September 1965. Video of the event by Martin Campbell: http://www.newsflare.com/video/54827/health-education/moving-schwitters-merz-barn-wall. Martin O’Connor, Charlie Holt and two others for week-end work out, March 7th to 9th. Mike Edmondson and Sam creating a new pond in front of the Merz Barn, and clearing trees and landscaping behind it to provide a new workshop space, 16.03.15. Sam & Reuben on site to complete the path to the second gate,17.06.15. The new gateway into Cylinders was finished, apart from the bridges across the streams, 26.09.15.
the fallen tree by the Merz Barn. Photo Martin Campbell. The Merz Barn site after the damaged tree threatening the Merz Barn was taken down. Photo Martin Campbell. Ian Hunter welcoming performing arts students from the University of Cumbria to Cylinders, 9.2.16. Photo Kate Marlais.